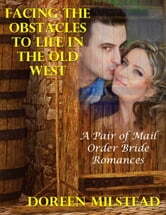 Mail Order Bride: High Society Woman & The Wolves, is about a high society woman in NYC who gets sent off to Oregon to be the bride of a lonely outpost operator. He is as stunned by her beauty when she gets off the train, as she is by the wilderness surrounding his cabin and home. She doesn’t know how to make a fire or even sweep the floor and her many trunks of fine clothing fill up his small cabin. Mail Order Bride: Jordyn Settles For Leftovers, is the emotional story of Jordyn, a woman who starts out by lying when she begins a correspondence with a rancher in Oregon who has advertised for a mail order bride. All she wants to do is get out west, learn how to run a ranch, then own one herself--just like she and her now deceased father had planned. Under other deceptions, she gets a free boat ride out to the west coast from a mail order bride company sending one hundred women in search of husbands.